I have always admired the cartoony goodness of Matt Hawkins' papercraft. 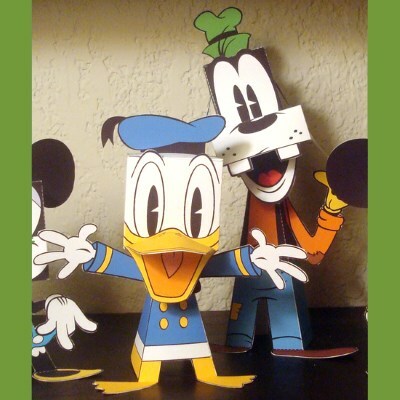 Waaay back in 2008 Matt produced a collection of promotional Disney paper toys that included Mickey, Minnie, Donald and Goofy. I did a post about the Mickey Mouse toy here. However, I was never able to locate any of the rest of the toys... until now (thanks to Joe V.) The Donald Duck and Goofy paper toys may be downloaded here. Now if I can just find Minnie, my set will be complete. Build photo by Matt Hawkins. Black Hole V.I.N.cent and B.O.B. The Japanese Emperor butterfly is found in every part of the main island of Japan. It is easily identified by its distinctive purple color. This paper model of the butterfly is offered by the Konica Minolta company on their website. Judging by the size of the template, it appears the finished model is slightly larger than life. 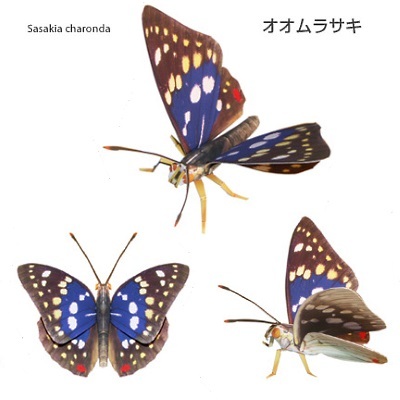 The scientific name of the Japanese Emperor is "Sasakia Charonda". 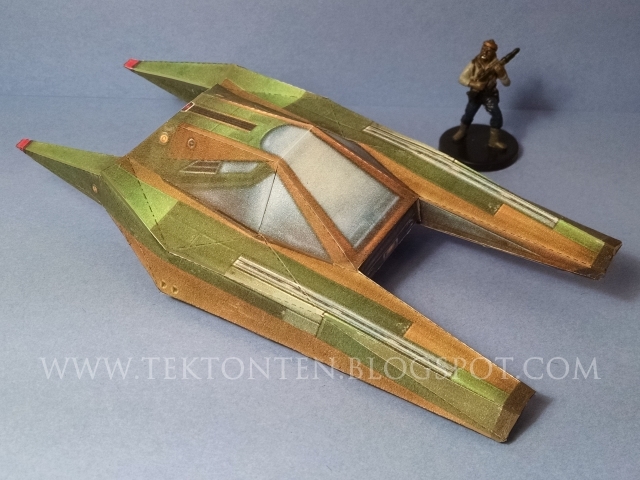 This papercraft airspeeder is based on a 3D model from the 2003 video game Star Wars Jedi Knight: Jedi Academy. It is similar in many respects to Zam Wasell's airspeeder in Star Wars Episode II. I made the model approximately 1:48 scale which is a scale that fits both Lego figures and Wizard of the Coast's Star Wars Miniatures figures. The model may look simple to build, but I give it a solid 4 out of 5 difficulty level. The template may be downloaded here. This is my papercraft release for February 2019 as promised in November. Ugh! 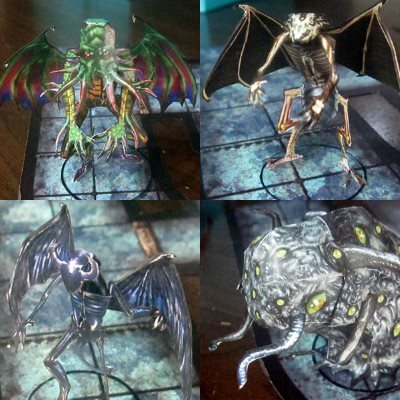 This group of uglies are some Cthulhu Mythos figures created for tabletop gaming by Eddnic at Fantasy Paper Miniature. Pictured are but 4 of the 15 characters available. From the upper left going clockwise there is Cthulhu, a Byakhee, a Shoggoth, and a Nightgaunt. Eddnic makes use of a papercraft technique some call "2.5D" because flat (2D) pieces of paper are used to create 3D effects. The Cthulhu Mythos universe began with the writings of H. P. Lovecraft and was expanded upon by subsequent writers. Here's another set of papercraft animals based on 3D models from the Zoo Tycoon 2 video game. This time we have a male and a female lion. The templates for the lions are in JPG format and may be downloaded from DrWheelieMobile's DeviantART page here. A little known fact about male lions is that their mane darkens with age. So the darker the mane, the older the lion.